Available in different sizes and of Oxo-Biodegradable technology. 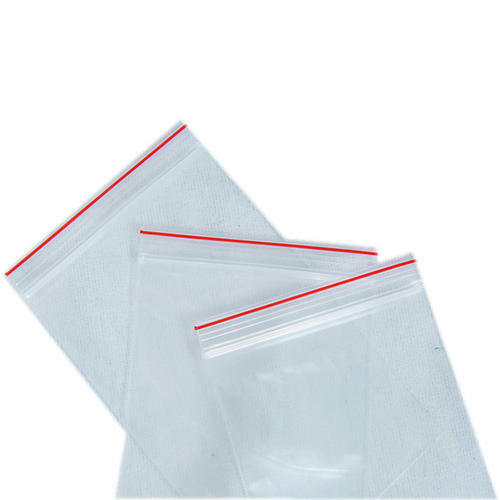 SymphonY can provide these bags with Red as well as Natural colored ziplock. Above certain size can be made with thick attached zip lock (to ensure extra safety). Each bag can be provided with welded J hook/Hangers for easy convenience. Highly acclaimed for manufacturing, exporting and supplying an extensive assortment of Plastic Bags, we "Symphony Polymers Pvt. Ltd." started our operations in the year of 2004. Product collection provided by us includes Oxo Biodegradable Garbage Bags, Oxo Biodegradable Plastic Bags, and Oxo Biodegradable Garment Bags. Since our incorporation, we are offering optimum quality products for our patrons. These products are made by using optimum grade plastic and eco friendly in nature. Offered range is highly admired in the market for their features like excellent finish, easy to carry, safe & hygienic nature and durability. Additionally, these are used in buying houses, garment exporters, big corporate, institutions, sugar factories, government and private hospitals, supermarkets and malls. Our offered products are useful in packaging purposes as well as find usage as master batch in manufacturing process of various degradable plastics. We are offering these products to match the clients’ specific needs as per the set industry standards. We assure to our patrons that all these offered range are quality proven by quality experts on predefined parameters. We have chosen every member of our team after a thorough analysis of their knowledge and past working experience. Moreover, our clients can avail these products at budget-friendly prices. To satisfy our clients in a well-defined way, offered collections of products are made according to their need.